Animals & Money: How many millions are we spending to shoot coyotes? The Environmental Group WildEarth Guardians says an anachronistic part of the Department of Agriculture spent $117 million last year to kill 2.4 million animals. The Wildlife Services has changed names plenty of times, but dates back to the days when the prevailing wisdom was just to wipe out any animals that got in the way of people. In its defense, the agency says it saves up to four times what it spends in agricultural losses. Of course, those would be private losses and we're spending tax money. The agency just agreed to start putting out its data in a readable form after pressure from WildEarth Guardians. Meanwhile the animal group estimated that about half of those exterminated were starlings (an invasive bird) but 122,000 were carnivore mammals (like coyote and bear). The Wildlife Services program accidentally knocked off reindeer, pronghorn sheep, foxes, and bald eagles, says WildEarth Guardian's Wendy Keefover-Ring. Their sloppy application of poisons has killed off pet dogs, like Jenna, a lab mix poisoned while hunting rabbits. Most tragically, 10 people have died in aerial shooting programs. Sure, some ranchers should be compensated for wildlife losses. The government should cooperate so frustrated ranchers don't take matters into their own hands. But the wildlife bureacracy has spread to cover all kinds of entrepreneurs from the cost of doing business. They also kill bears to protect logging companies (bears like seedlings). Federal agents bumped off 300,000 blackbirds who's big crime was eating sunflowers grown for birdseed. Fish farmers get protection from birds, too.Some of the money does come from state or even private funds. But the agency hasn't made it easy to figure out how much they're spending on what. About $56 million of the $117 comes from private funds. The USDA budget for next year lists $77 million for wildlife services operation, plus another $41 million on pest detection. Remember how the federal government wants to kill wild horses because they're too expensive to keep? That's only $37 million to manage the entire species. Keefover-Ring is most outraged over the aerial hunting, which she calls ineffective "dumb and dangerous." Since the agency started mass-killing coyotes in 1915, their range has tripled, she says. Last year the USDA killed more than 90,000 coyotes, she says. 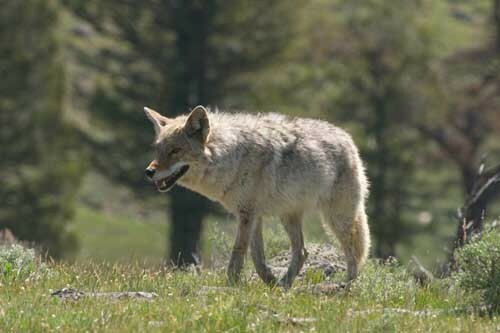 Texas alone spent $14 million to kill 19,000 coyotes--at about $740 per canine. The agency is starting to play with non-lethal devices that scare predators away, protect crops and livestock or prevent predators from breeding. But WildEarth says they can't tell from public documents how much money and effort they're really putting into non-lethal control. Meanwhile, taxpayers are paying both to protect wildlife and to kill it. "One agency reintroduces animals and while you have another killing them. Makes a lot of sense," she says.